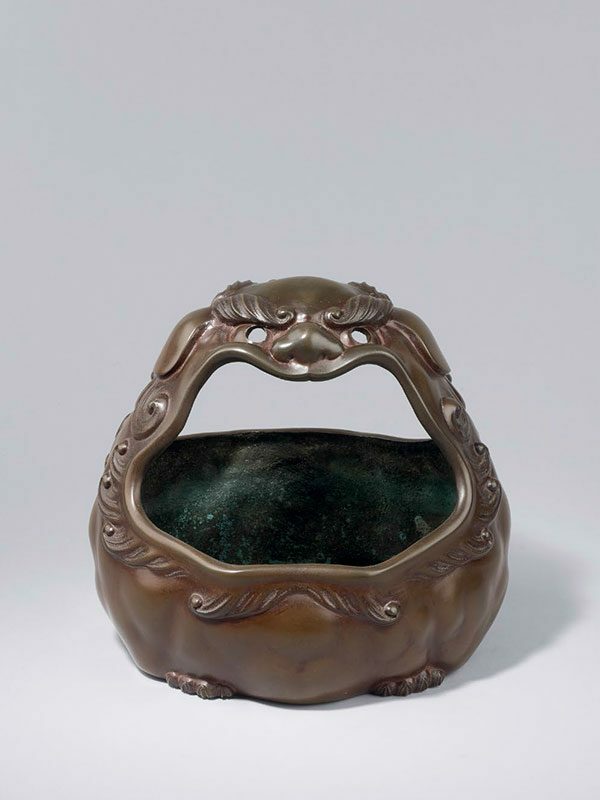 A bronze hand warmer of circular form, with a handle in the form of two shishi lion masks, back to back, with openwork eyes, a broad nose and pronounced eyebrows. The metal has an attractive brown patina. The side is stamped with the maker’s mark Kozan. The original tomobako has a paper label attached to the side, which reads: Shishi te-aburi. Kozan (hand warmer, Shishi lion, Kozan). Sakai Kozan was director of the Takaoka Chugei-sha, Takaoka metal ware, Toyama Prefecture. The workshop was originally founded by his ancestor Sakai-ya Riemon during the Keio era (1865-1868) of the late Edo Period. The workshop made cast bronze works; some were commission works on a monumental scale, such as a bronze incense burner at the Zenkoji Temple (Nagano Prefecture) and a bronze Buddha statue (28 meters in height and 80 tonnes in weight) at the Nagahama-Biwako Lake, Shiga Prefecture.